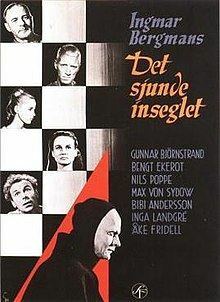 Much studied, imitated, even parodied, but never outdone, Bergman’s stunning allegory of man’s search for meaning, The Seventh Seal (Det sjunde inseglet), was one of the benchmark foreign imports of America’s 1950s art-house heyday, pushing cinema’s boundaries and ushering in a new era of movie-going. The screening will preceded by the Academy Award nominated short film De Düva (The Dove) and other festivities! This is a part of SACC Arizona's #Bergman100 commemoration of the Swedish film creator's birth. Presented in collaboration with FilmBar Phoenix, Swea Arizona and the Consulate of Sweden in Arizona.